Let us begin the process of creating your bespoke jewellery. 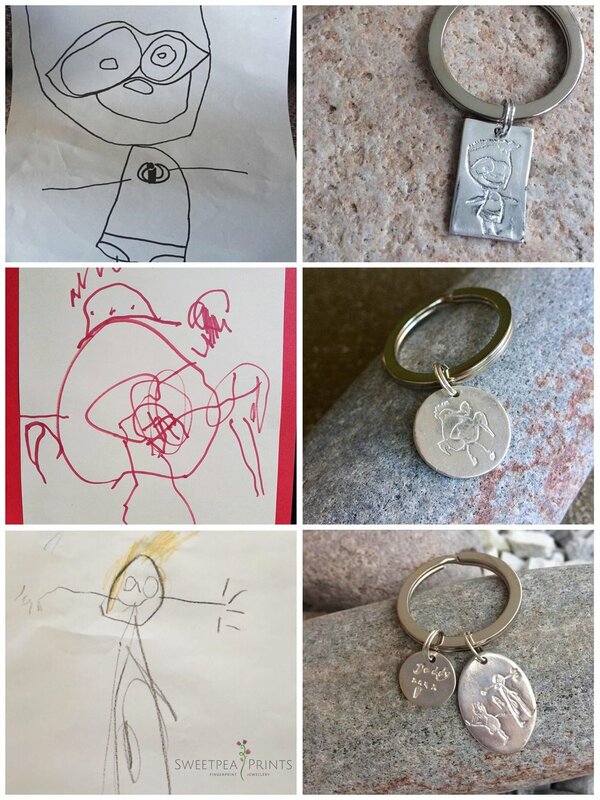 If you are local to Moray, a physical print into the silver will give wonderful results for your charm as the fine detail of the fingerprint is transferred extremely well, especially for younger children and babies. This means that your charm has then been 'touched by the one you love'. Fingerprint Putty Kits can also be sent to you though the post to capture at home (this service is available in the UK with FREE DELIVERY and Worldwide postage can be arranged). Full instructions are included within the kit and I also have a VIDEO TUTORIAL HERE. You may wish to continue with creating the charm as the shape of their fingertip is imprinted and this is still very special. You may choose to cast into the silver directly at the Studio. You can try the putty again (additional kits are sent at further cost to you). If you do decide not to continue with your order, a full refund will be given less the cost of any Fingerprint Kits that have been sent to you. Please see details below about Payment, Returns and Cancelling an Order. I have a range of materials to choose from at the Studio to try to obtain the best possible relief putty prints for you to use on your chosen keepsake and I would only ever advise that the impression is not useable as a very last resort- I want it to be perfect for you! The Miniature Prints range (hand, foot, paw, handwriting, drawings) captures those precious prints in a perfect size for your chosen charm. This process for hand, foot or paw prints are carried out using an Inkless Print Kit which is sent though the post to your home and don't worry, there isn't any messy paint involved and is safe to use from birth! You send the magic prints back to me either in a S.A.E or you can scan and email it me so I can transform them into your Miniature Print, scaled beautifully to fit your chosen charm shape and size. For handwriting samples or children's simple drawings, you can scan the original at home and email them to me or if you prefer, you can post them or drop them off for me to scan at the studio. Simple, well-defined drawings (ideally black ink on white paper) will transfer into silver very well although much of the finer detail may potentially be lost as the drawing is scaled down. Samples of handwriting taken from a document/card/photo will not look exactly the same once it is in silver but as the handwriting is familiar to you, it will still be a treasured and sentimental keepsake to have immortalised in fine silver. Original prints, drawings, documents etc are never altered in any way during the process of creating your keepsake so rest assured your original stays at it's best. This service is available in the UK and Worldwide so you do not need to live in Moray to have your own Sweetpea Print keepsake created. Contact Me to discuss this process and chat through your design ideas. The fine silver clay is rolled out to a thickness of your choosing- regular or chunky, and your chosen shape is stamped around the Fingerprint or Miniature Print. The clay is then sanded and refined, inscribed with a special name, date of birth or small message on the reverse and then fired in my kiln. Your charm is polished to a high-shine finish and packaged in a ribbon-tied Sweetpea Prints presentation box. Here's a video tutorial to help you re-tie your ribbon at home if you have opened the box and would then like to re-tie it the way it came. All fine silver charms are handmade at the Sweetpea Prints studio and due to the nature of the crafting process, a uniform finish across your charm cannot be achieved. You will notice fine curves, creases and indentations on the surface of your charm - these are not imperfections but individual characteristics that are created when the clay is rolled and worked with. Much like a fingerprint, each silver charm is unique and the organic nature of the silver is one more way your jewellery becomes just as individual as you...there is such a unique and tactile feel to each single piece of silver that could never be replicated again. Please ensure you are happy with your prints at the time of printing (either at home or at the studio). By returning any Putty Kits or Inkless Print Kits to me, you are approving them for use on your keepsake. Fingerprint putty moulds and miniature print stamps can be held in the studio should you wish to use them at a later date to reorder charms. For very special prints such as those from loved ones you have lost, I would advise you keep their prints at home in a fire-proof box. You need not send physical paper prints to me at the Studio as photocopies or emails of scanned documents work just as well. Any physical prints, for example those being sent directly from a funeral home, should be sent to the Studio be via Special Delivery if you cannot physically deliver them. Please bear in mind that sending any original document or print through the post always incurs an element of risk that the item could go missing. When any print is received at the Studio, I will confirm their arrival so you have peace of mind they have arrived safely and I will let you know when I have posted an item out to you. If you know which items you would like to order prior to your printing appointment, payment can be made via bank transfer. Please Contact Me for details. I also accept cash and Visa, Maestro, MasterCard & American Express debit/credit cards at your printing appointment. Gift Certificates are also available and can be Gift Boxed if you so wish for an additional fee. Replacement kits can be sent out to you in the post and will include a pre-paid envelope back to me at the Studio. Fingerprint Putty Kit - Charged at £5 per kit for one person. Inkless Print Kits - Charged at £5 per kit for one person. If you already have prints, handwriting samples or children's simple drawings, you can email them to me. Please Contact Me to discuss this process. Once your piece of jewellery has been checked by me to ensure the highest quality, it will be sent to you in a ribbon-tied Sweetpea Prints presentation box including FREE Royal Mail Special Delivery Guaranteed by 1pm - giving you peace of mind that your special keepsake is being handled with care. Worldwide postage is available and prices will be confirmed for you before posting. A great amount of care, love and attention goes into every Sweetpea Prints keepsake I make and I hope you will be delighted with your purchase. However, if your keepsake should arrive with you and a manufacturing fault is found, please Contact Me, to discuss a repair or replacement at no further cost to you. If an item arrives and you decide you no longer want to keep it or personalisation is incorrect due to an error on your behalf, a return cannot be granted due to its personalised nature and no refund can be given. (Consumer Rights Act 2015). Please check your order details carefully in particular text you wish to be inscribed onto your keepsake or any design requirements you have specified such as Fingerprint/Miniature Print placement. The costs involved to rectify/remake a keepsake will be borne by the customer. Due to the delicate nature of silver, your jewellery can become damaged. Please visit the Silver Care section for more information on how to care for your silver. Inspect your jewellery and fittings regularly for signs of wear to minimise the risk of loss. In the unlikely event your jewellery needs a repair within six months (not including damage caused by obvious misuse, lost or stolen items, general wear and tear, scratched surfaces or snapped chains), please contact me to discuss a repair. Items are to be sent by Special Delivery and postage should be borne by the customer. If I have not begun to make your keepsake or artwork, then you can cancel your order and a full refund will be given. If any Fingerprint Putty or Inkless Print Kits have been sent to you, a partial refund (less the cost of the kit) will be given. Please enjoy looking at the entire range of jewellery & keepsakes that I have to offer at Sweetpea Prints. You are most welcome to Contact Me via this website, the Sweetpea Prints Facebook page or on my mobile 07528 586658 to discuss your queries, orders and printing appointments. I look forward to meeting or chatting with you.